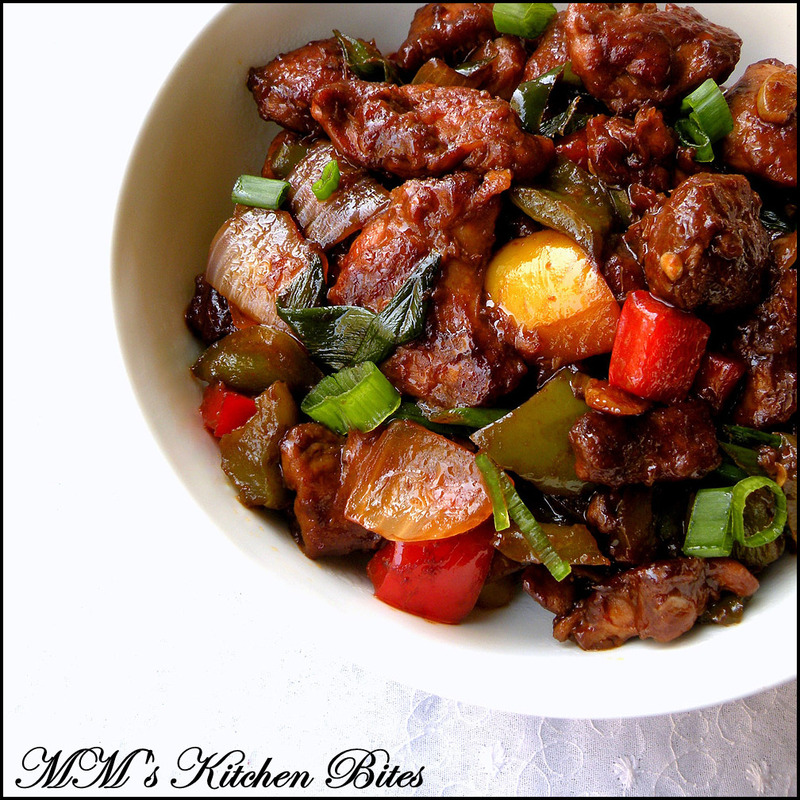 MM's Kitchen Bites: Chili Chicken...it happens only in India!! Chili Chicken...it happens only in India!! Wash and clean the chicken. Remove all the extra fat and cut into bite sized pieces. Marinate the chicken with corn starch, soy sauce, ginger paste and garlic paste for about half an hour to overnight. If you are marinating overnight, get the chicken back to room temperature before you start cooking. You can finely chop the garlic and green chillies. I like to pound them lightly just to break them up lightly in a mortar pestle or with the back of a knife. Heat a large wok or frying pan over high heat. Heat 2 tbsp oil and add in the chicken. Toss the chicken around and keep turning the pieces so that the chicken cooks and turn golden brown evenly. The chicken would be done in about 5-6 minutes. Lower the heat take the chicken out and keep aside. Get the heat back to high (and keep it there) and add in the remaining 2 tbsp oil. Add in the garlic and half of the green chillies. Be careful as this could splutter. Once the garlic starts to change colour, add in the sauces and mix around. Toss in the onions and let them cook for a minute. Add in the bell peppers and toss around for another minute or so. Add in the chicken and the remaining green chillies. Toss and mix everything well together so that the chicken absorbs the sauces. Add in the long spring onions and switch off the heat. Again toss around so that the greens also get coated and go soft in the residual heat. Serve immediately, garnished with finely chopped spring onions. Adding colured peppers is again not how it was done originally- only onions. The fancier versions additionally had only green bell pepper added in with onions. That bowl of Chilli Chicken is droolworthy!!! Absolutedly loved the dark shade of it!! This chili chicken looks fabulous! I love spicy food so I will give this a shot. Thanks for sharing this recipe. this dish looks very tempting and delicious. 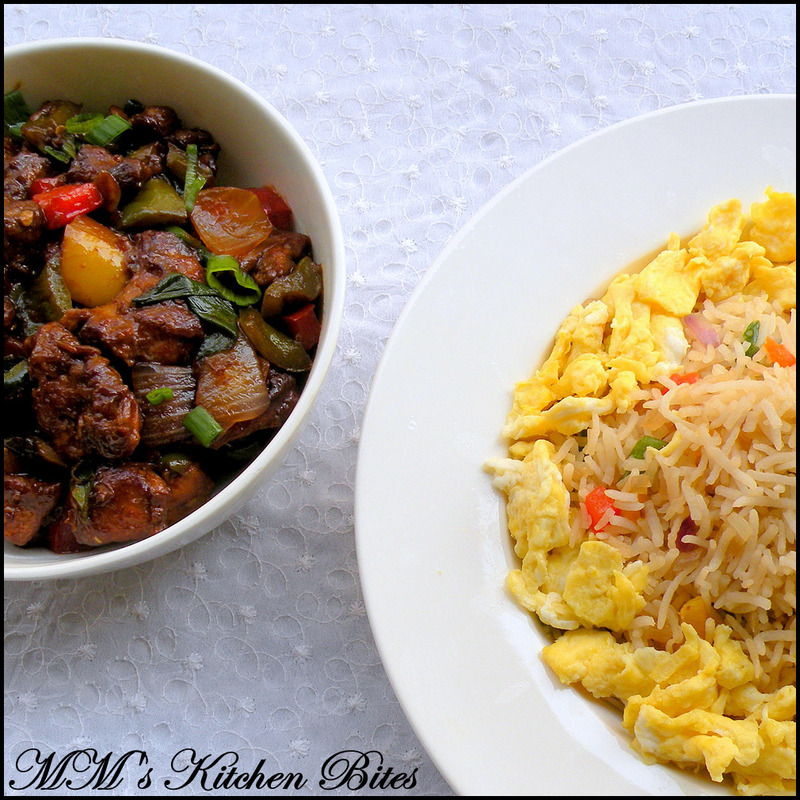 Spicy foods are my favorite, which makes me love Indian recipes too and this one is a must-try! Thank you and i'll drop by again for more recipes. This dish looks delicious. I very like spicy food. I will try this recipe next time. Thaks for sharing chili chicken recipe..
Ginger Fried Rice...Fred and Ginger!!! Green Peas and Mint Soup...I am back! !